The Border Security, Economic Opportunity, and Immigration Modernization Act (S. 744) is a bi-partisan immigration reform bill with several components, including: (a) creating pathways to citizenship for undocumented youth and adults; (b) preserving family unity by clearing out green card backlogs; (c) expanding protections for asylum seekers and refugees; and (d) reforming immigration detention. However, the bill has significant gaps and problematic provisions that must be addressed before it can be truly comprehensive. Why is immigration reform necessary? 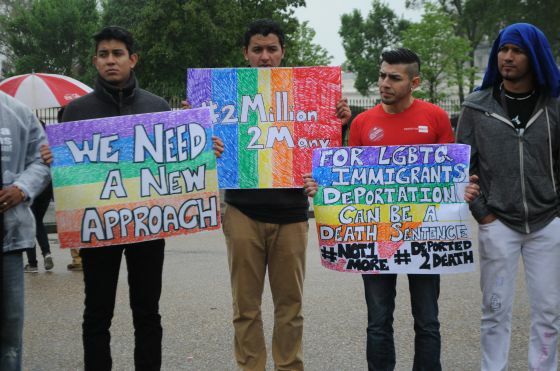 Shortcomings and inequities in current United States immigration law impact an estimated 267,000 LGBT adult undocumented immigrants, of which an estimated 15,000 to 50,000 are transgender, along with their families. In a population that is already highly marginalized, transgender immigrants are among the most vulnerable to discrimination and violence, including in the immigration system itself. Often, transgender immigrants are disproportionately affected by problems in our current immigration system, especially with regard to family recognition and unification, asylum, detention, solitary confinement, and employer verification issues. We need immigration reform to address the systemic problems that affect all immigrants and especially those who suffer additional injustices because of their transgender status. What additional reforms are needed? Decrease reliance on our wasteful and inhumane detention system and sharply limit solitary confinement. How will immigration reform make the United States stronger? Passing common sense immigration reform will strengthen our country economically and socially. Providing legal status to millions of undocumented workers will increase federal tax revenue, increase the GDP, and decrease the federal deficit because the influx of immigrants’ higher wages will help grow the economy. Including UAFA means that US citizens will not have to leave the country to be with their foreign-born partners while taking their talents and economic contributions with them. Enacting common sense immigration reforms will strengthen our families, our economy, our diverse culture, and our tradition of fair treatment and opportunity for all.